President Donald Trump began his Monday by retweeting a pair of conservative commentators who blasted "antifa" and former President Barack Obama to help defend the president's response to the violence in Charlottesville, Virginia and his pardon of Joe Arpaio, a former Arizona sheriff. Trump initially retweeted conservative author Dinesh D'Souza, author of books such as "Hillary's America: The Secret History of the Democratic Party" and "The Big Lie: Exposing the Nazi Roots of the American Left," who had quote-tweeted a Washington Post article with the headline "Black-clad antifa attack peaceful right wing demonstrators in Berkeley." "Finally, as if by accident, the @washingtonpost breaks down & admits the truth about where the violence is coming from," D'Souza wrote. The Post story was a report on a large group of "anti-fascists" barreling into a Sunday protest in Berkeley, California, and committing acts of violence on right-wing protesters. A pepper-spray wielding Trump supporter was smacked to the ground with homemade shields. Another was attacked by five black-clad antifas, each windmilling kicks and punches into a man desperately trying to protect himself. A conservative group leader retreated for safety behind a line of riot police as marchers chucked water bottles, shot off pepper spray and screamed "fascist go home!" All told, the Associated Press reported at least five individuals were attacked. An AP reporter witnessed the assaults. Berkeley Police’s Lt. Joe Okies told The Washington Post the rally resulted in "13 arrests on a range of charges including assault with a deadly weapon, obstructing a police officer, and various Berkeley municipal code violations." The protest was one of many that have sprouted in the aftermath of Charlottesville, where a white supremacist mowed down a large group of counterprotesters with his car, killing one person and injuring roughly 20 more. The Charlottesville protests began with white nationalists rallying against the removal of a statue of Confederate Gen. Robert E. Lee. Trump's response to that incident was widely panned by both the left and the right as inadequate. 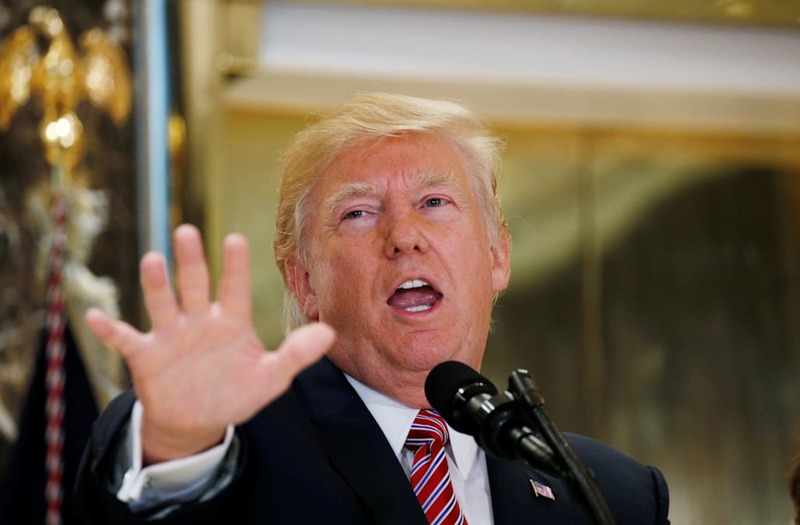 Trump initially blamed "many sides" for the violence before condemning the racist movements that gathered. But during a press conference at Trump Tower later that week that was supposed to focus on infrastructure, Trump reverted to his earlier position, claiming that the "alt-left" was at least partially responsible for the violence as well and wondering whether the counterprotesters have any "semblance of guilt." The president followed up his retweet of D'Souza by retweeting conservative commentator Katie Pavlich, who quote-tweeted former Obama foreign policy adviser Ben Rhodes. Rhodes had blasted Trump for his Friday pardon of Arpaio, the former Maricopa County sheriff who was convicted criminal contempt for ignoring a court order to stop racial profiling of Latinos. "Obama used his pardon and commutation power to give a second chance to people who deserved empathy, not racists who showed none," Rhodes wrote. "Your boss pardoned a traitor who gave U.S. enemies state secrets, he also pardoned a terrorist who killed Americans," she wrote. "Spare us the lecture." Pavlich appeared to be first referencing Chelsea Manning, the former Army soldier who disclosed confidential information to WikiLeaks. Manning served seven years in federal prison before Obama commuted her sentence shortly before his time in office was complete. The "terrorist" Pavlich referenced was likely Oscar Lopez Rivera, a Puerto Rican militant who served 35 years of a 55-year sentence for "seditious conspiracy" before Obama commuted the sentence of the 74-year-old right before the conclusion of his presidency. Trump's Friday night pardon of Arpaio was met with widespread ridicule on both sides of the aisle. Arpaio became a notorious figure over the more than two decades he spent leading the sheriff's office. Perhaps what he is best known for was keeping inmates in a "tent city" jail under inhumane conditions. He himself once called the sweltering open-air facility a "concentration camp." An outspoken Trump supporter, Arpaio was one of the leading figures of the "birther" movement, which sought to discredit Obama by claiming he was not born in this country. The Post reported this weekend that Trump apparently asked Attorney General Jeff Sessions whether dropping the case against Arpaio was a possibility, to which Sessions said it would be inappropriate. He did say then, though, that a pardon could be granted upon Arpaio's conviction, a move that Trump was reportedly "gung-ho" about. Trump added in another Monday-morning retweet shortly after, promoting a tweet from an inspirational quotes account. "No color, no religion, no nationality should come between us, we are all children of God. - Mother Teresa," the tweet read.